Pill shown is not actual size. ODEFSEY is 3 medicines in 1 pill. It is a combination of emtricitabine, rilpivirine, and tenofovir alafenamide. View the Patient Information with important warnings. Ask your healthcare provider if ODEFSEY is right for you. Learn about financial and insurance support for eligible patients. Get daily support by downloading a free app at MyDailyCharge.com. 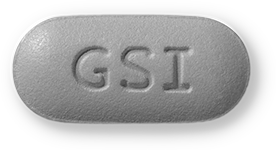 ODEFSEY, the ODEFSEY Logo, DAILY CHARGE, the DAILY CHARGE Logo, GSI, GILEAD, and the GILEAD Logo are trademarks of Gilead Sciences, Inc., or its related companies. By following this link, you are now leaving www.STRIBILD.com. This site is not controlled by Gilead Sciences, Inc. Gilead Sciences, Inc. is not responsible for the site’s content or your use of it.